Cape May in New Jersey is one of the prettiest coastal towns you could ever visit here in the United States. It's a year-round coastal community that always has something going on. They have a great art scene, offer both fine & casual dining, have their own theater, great shopping opportunities and so much more. Plus, let's not forget the beach scene! Most of the beaches in Cape May require you to purchase beach tags during the in-season time of the year. However, if you know where to look, you can find the free beaches too! You can enjoy the beach for FREE at Cape May Point Park, at Sunset Beach and at HIGBEE Beach to name just a few! Plus, parking is free at all three of those locations! 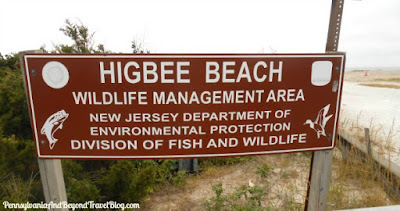 If you're not familiar with HIGBEE Beach, it's located right beside Sunset Beach, at the end of Sunset Blvd. This is the most southern tip of New Jersey! You'll want to park in their designated parking lot to enjoy it. The beach is only a few steps away and parking is always FREE! When visiting, I do recommend you wear flip-flops or water-shoes because their beach is pretty rocky in some places. In other areas, it's smooth and you can go barefoot. Every time we visit this beach, it's rarely crowded and you can sit for awhile on the beach or just take a nice walk. Whatever you prefer. One of the reasons we like visiting HIGBEE Beach is to go Cape May Diamond hunting! These little stones are really clear-colored quartz stones that have been smoothed & polished naturally by the tide & waves. The locals around the area call them Cape May Diamonds because they look beautiful just like a fine diamond, but without the high cost! You can shop for this type of jewelry at the Sunset Beach Gift Shop, if you prefer that. If you're going to be visiting Wildwood and/or Cape May, we highly recommend that you check out HIGBEE Beach...at least once during one of your many trips down to the Jersey Shore! Note: You can click on each photo in this travel feature and it will open up in a new window & in an enlarged size. This will allow you to see a larger view & you'll be able to view all of the smaller details in the photo. I would love to travel to Cape May and walk on the beach. It would be fun to collect some of these polished stones too.